Yesterday, Google’s Head of Web Spam, Matt Cutts, shared a link to a simple Docs survey where they’re asking webmasters to report high-quality small sites that you think should rank better. Yes, you heard that right. They want to know about GOOD sites! While Google has been working hard over recent years to make it easier for the Web Spam team to connect with and inform webmasters, they’re usually looking for help outing bad sites. Whether it’s more support for reconsideration requests, new language on link schemes, or the recently released (then revoked, then re-released) Manual Actions report in Webmaster Tools. For years we’ve debated the issue of size and brand as it relates to rankings and it’s interesting to see that Google is now soliciting advice from the masses to test the quality of the algorithm. The debate has raged since 2008 (and before). 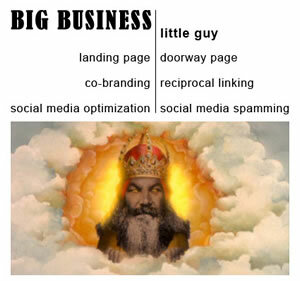 I put the “big business vs little guy” graphic together (thanks Todd for sharing it so long ago) to help sort through some hypocritical assumptions on Google’s part when it comes to website behavior. We’re used to the perception that big brands get away with murder while small businesses suffer, but I’ve always believed that when it comes to the algorithm it really is a matter of brand signals versus the actual size of the brand. The more sites behave like actual businesses and invest in brand development, the more they’ll align with the direction Google is going with quality signals for greater search rankings. At first we didn’t believe the survey was legit, because it’s so simple. How could Google possibly review all of the submissions they’ll undoubtedly receive? But truthfully, how many webmasters feel confident enough in their site’s backlink profile to submit? @Rhea Seems like a desperate move to me. Isn't Google's job to determine "good" sites? @Rhea I don't know of a single site owner that doesn't think their site should do better, so I don't see how it will be helpful. @Rhea & w/G's ever changing rules (rapidly expanding nofollow demands etc) I'm not sure anyone should want G looking closely at their site. @robdwoods nah, less than a couple hundred so far. It's a good way to get input from a wider circle of folks. Home › Internet Marketing Blog › SEO › Google Wants You to Out Good Sites. Really!